As an engineer in school I studied the physical sciences - Chemistry, Physics, Differential Calculus and my favorite Statistics but lately I’ve been studying things which I would have laughed at when I was in Engineering school. That is the behavioral sciences of Adult Learning and Change Management. Specifically I’m interested in why people are afraid of change, how to overcome it and how to maximize the learning we get from making changes. Turns out it goes way back to the dawn of humanity as our brains were developing. Simply put, our brains have three sections; the reptilian or limbic brain located at the brain stem which controls our basic functions; our mammalian brain which contains our emotional center, and the prefrontal cortex which is the part of the brain that is most developed in primates and makes us most human in that it contains the reasoning and logic centers. Our limbic system is much older than the other structures in our brains and developed to manage the “Flight or Fight” response. That’s the part of our brain that responds to threatening situations with a response that decides either to run away – the flight or to stand and fight. The decision isn’t based on logic or even emotion but is decided upon by this ancient part of our brain that overrides the other more highly advanced sections of the brain. It’s a basic survival mechanism. What has this got to do with Kaizen? This same mechanism kicks in when we are faced with changes. Its part of the fear of change and overcoming it is a large part of change management. I’d like to suggest that kaizen can be a great way of overcoming this fear of change and can greatly simplify change management. 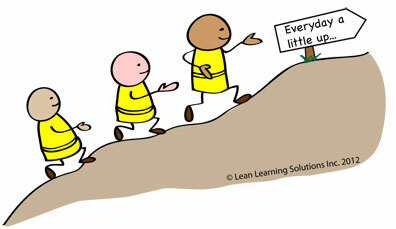 By kaizen I mean kaizen as small, steady, relentless continuous improvement not as big workshops or events. The kind of Quick & Easy Kaizen that is practiced every day. Turns out we can absorb small changes and that a series of small changes is easier to make than one big change. The key is the repetition. Small daily changes quickly turn into a routine that is no longer threatening. It becomes a habit and minimizes the threat and so minimizes the Flight or Fight response. The words of Taiichi Ohno ring in my ears “Every day a little bit higher”. What does this mean for the Lean community? Don’t fight basic biology. Combine daily Quick & Easy Kaizen with a focus on delivering Customer value you can use it to your advantage. You’ll get more improvement done quicker with less resistance. Go ahead and try it. I’d love to hear how you did.